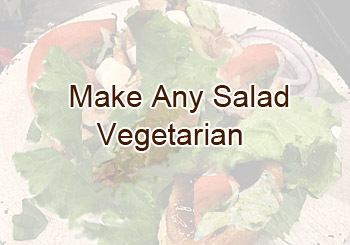 Any Salad can Be Vegan Style. See Below. 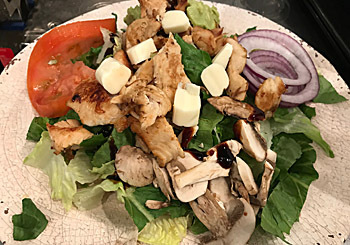 Sliced chicken breast on a large bed of chopped romaine, balsamic glaze, mushroom, mozzarella pearls, red onions, avocado slices, bacon bits, and bleu cheese dressing on the side. 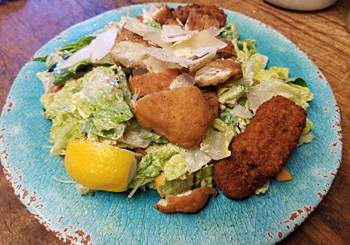 Sliced crispy chicken on a bed of chopped romaine tossed in a chipotle Caesar dressing with jalapeno poppers on the side. 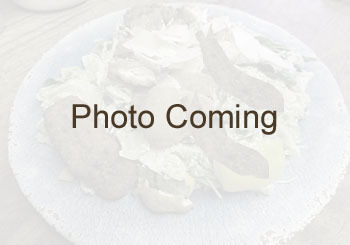 Teriyaki glazed chicken on a bed of chopped romaine. 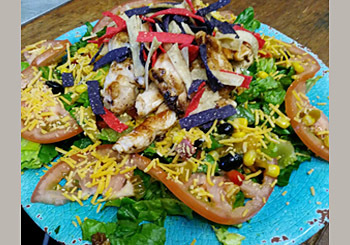 Southwest seasoned chicken on a bed of chopped romaine, mango-jalapeno-corn-black bean salsa, tomato, grated cheddar, Southwest dressing or your choice. Option is: Black bean chipotle add $1.